Phyto 9 is a nourishing day cream for dehydrated hair. Containing a mixture of Macadamia oil and plant extracts, this cream hydrates and nourishes the hair to leave it smooth and moisturised. Althaea Officinalis Root Extract (Mucilage Végétal), Lecithin (Soja), Prunus Armeniaca (Apricot) Kernel Oil, Macadamia Ternifolia Seed Oil, Helianthus Annuus (Sunflower) Seed Oil (Tournesol), Glycerin, Arctium Lappa Root Extract (Bardane), Calendula Officinalis Flower Extract, Hypericum Perforatum Flower Extract (Millepertuis), Rosmarinus Officinalis (Rosemary) Leaf Extract (Romarin), Salix Alba (Willow) Leaf Extract (Saule), Salvia Officinalis (Sage) Leaf Extract (Sauge), Propylene Glycol, Tocopherol, Phenoxyethanol, Butylparaben, Ethylparaben, Methylchloroisothiazolinone, Methylisothiazolinone, Citric Acid, Potassium Sorbate, Sodium Dehydroacetate, Sodium Benzoate. Botanical & Natural Origin. Moisturised scalp and made hair easier to style. Beautiful stuff - nicer than using gel. 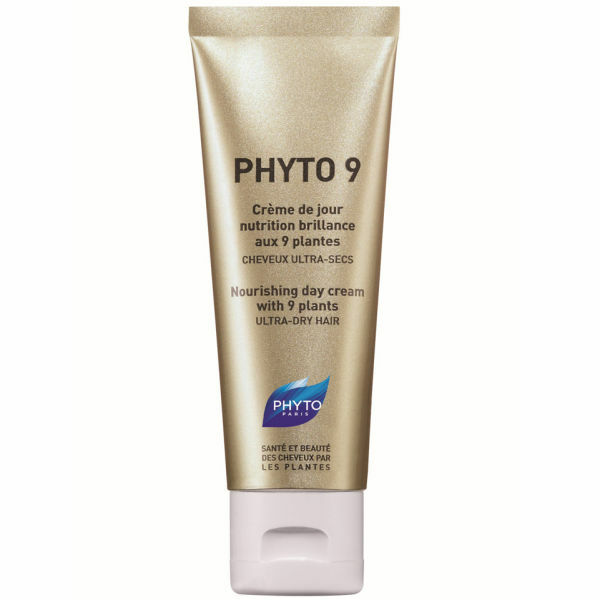 I used to have very dry hair - mostly due to a lot of swimming - and I found this the best product to solve chronic dry, brittle hair. I now use it every couple of days as an alternative to a normal conditioner - highly recommended.